PIXEL CUP SOCCER 16 is now available on the App Store!!! Pixel Cup Soccer is a retro-style arcade soccer game with simple controls and fun, addictive gameplay. Choose from 32 national teams to play friendly matches, the Pixel Cup championship, and awesome fun player-versus-player matches! 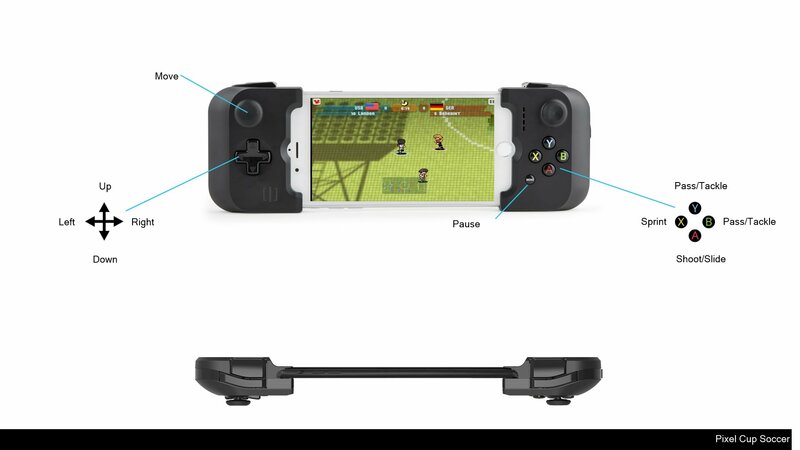 - Local player-versus-player mode you can play with MFI (Made For iPhone) game controllers. - Simplified controls: shoot, pass, and run your way to victory. - Pick-up and play with clean and challenging gameplay. - Retro-style pixel art game resembling classic 8-bit games, evoking nostalgia. - Play as one of 32 national teams, the same countries that played in Brazil 2014. - Choose your favorite team and lead them to win the Pixel Cup Championship. - Customize your match time and speed. - Face off in different weather conditions and stadiums. - Show off your achievements in the Pixel Cup mode on the Game Center. - Share your replays with Everyplay. - Friendly Game mode: Play a single game against the computer. - Pixel Cup mode: Lead your chosen national team against the computer to win the championship through group play and a “Round of 16” format .